The concept of distance is quite intuitive. For example, when we cluster animals into subgroups, we are implicitly defining a distance that permits us to say what animals are “close” to each other. Many of the analyses we perform with high-dimensional data relate directly or indirectly to distance. Many clustering and machine learning techniques rely on being able to define distance, using features or predictors. For example, to create heatmaps, which are widely used in genomics and other highthroughput fields, a distance is computed explicitly. In these plots the measurements, which are stored in a matrix, are represented with colors after the columns and rows have been clustered. (A side note: red and green, a common color theme for heatmaps, are two of the most difficult colors for many color-blind people to discern.) Here we will learn the necessary mathematics and computing skills to understand and create heatmaps. We start by reviewing the mathematical definition of distance. 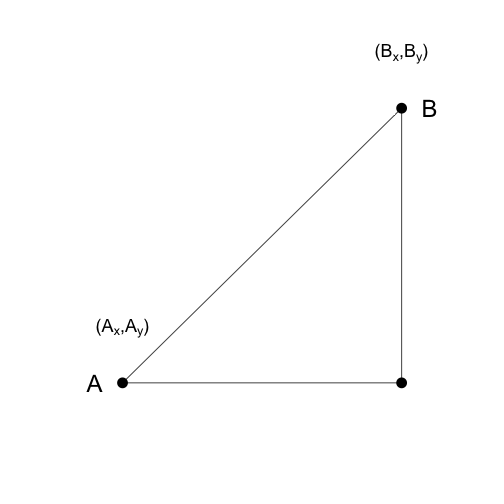 As a review, let’s define the distance between two points, and , on a Cartesian plane. The data represent RNA expression levels for eight tissues, each with several individuals. We are interested in describing distance between samples in the context of this dataset. We might also be interested in finding genes that behave similarly across samples. with and columns and . This result can be very convenient in practice as computations can be made much faster using matrix multiplication. We can now use the formulas above to compute distance. Let’s compute distance between samples 1 and 2, both kidneys, and then to sample 87, a colon. It is important to remember that if we run dist on e, it will compute all pairwise distances between genes. This will try to create a matrix that may crash your R sessions.